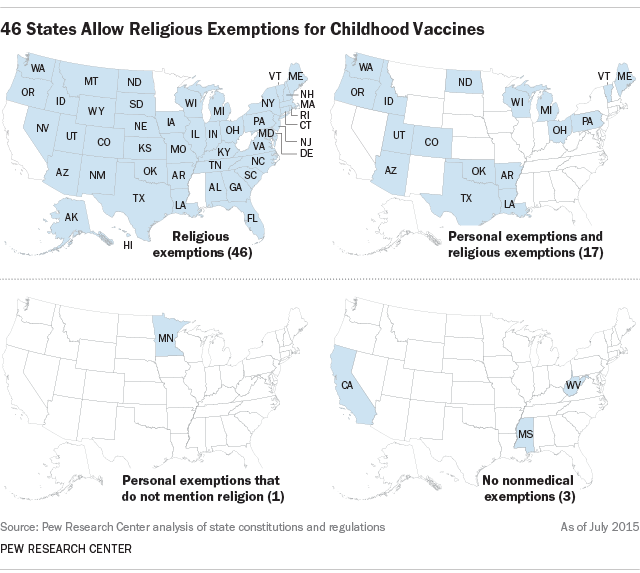 Forty-six states currently allow children to be exempt from vaccinations due to religious concerns, including 17 states that also allow exemptions for “personal reasons,” according to a Pew Research Center analysis. One state, Minnesota, allows parents to not vaccinate their children based on a broader “personal” exemption that does not explicitly mention religion. Only three states – California, Mississippi and West Virginia – do not offer any nonmedical vaccine exemptions. California recently enacted a law – set to take effect on July 1, 2016 – that will eliminate both personal and religious vaccine exemptions. Legislatures in other states, such as Pennsylvania, also are considering eliminating personal exemptions. Meanwhile, Colorado recently made the exemption process more onerous. While the state continues to offer both personal and religious exemptions, parents must submit new exemption paperwork every year. Our analysis found wide variation among the states in how vaccination exemptions are administered. Some states have strict guidelines surrounding religious exemptions. Delaware, for instance, requires parents to submit a notarized affidavit stating that a sincere belief in “a Supreme Being” is the reason for the exemption request. And Oregon requires parents to obtain a “vaccine education certificate,” either from a health care provider or by viewing an online seminar, before their child can be exempted. And even though 46 states allow religious exemptions for vaccinations, researchers and journalists have struggled to identify a single major U.S. religious group that currently advocates against vaccination for children. Some of these exemptions exist “at least in part owing to the lobbying efforts of the Christian Science Church,” according to an article in the Annual Review of Public Health by Douglas Diekema, a doctor and bioethicist at Seattle Children’s Hospital. But even though the church is well known for its belief in healing through prayer, it does not advocate that its members refrain from vaccinating children. Some components of vaccines could theoretically cause other religious concerns. Certain vaccines contain gelatin that is derived from pigs, including some measles, mumps and rubella (MMR) and varicella (chicken pox) vaccines, and many Jews and Muslims do not consume swine products. However, many religious authorities from Judaism and Islam have said that the vaccines are permissible. Note: This post was originally published on Feb. 25, 2015, and updated on July 16 to reflect California’s enactment of a law that will eliminate both personal and religious vaccine exemptions as of July 1, 2016.